Have you ever heard of an “oxymoron”. No, it isn’t a word for a less than intelligent TV detergent salesman. It is a term that describes two things that common sense tells us don’t go together- like “jumbo shrimp” or “government assistance” or a “principled politician”. We may have to scratch that last example from our list. Surprisingly, there are still some in Washington who are committed to doing what is right in spite of the consequences to their political careers. Unless you live in a non Wi-Fi accessible cave you know the big issue blaring away in the media is the fate of the massive health care reform bill pending before congress. As written, this complete overhaul of nearly 10% of our nation’s economy is huge – nearly 2,000 pages long, nearly incomprehensible to even seasoned policy wonks, and wildly unpopular – the latest Rasmussen polling data suggests a solid majority of Americans oppose passage of the current bill. Although voted down once before, a resurrected version of the bill is now approaching a key vote in the House of Representatives. Will this society changing bill become law? It may all come down to one issue – Abortion. 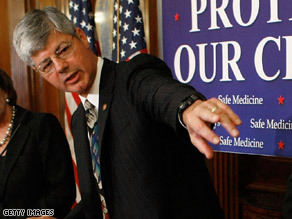 Pro-life Representative Bart Stupak a Democrat from Michigan has indicated that he and eleven other congressmen will vote against the bill, unless specific language is included that will exclude the funding of abortion. Those favoring the passage of the health care overhaul have expressed shock that this one issue would be significant enough to bring down the entire legislative effort. GEORGE STEPHANOPOULOS: Let’s bring in Congressman Stupak now. And, Congressman, you heard Secretary Sebelius there. She said the President’s bill, the President’s proposal, does not change the status quo on abortion, does not have federal funding on abortion. Do you agree? And can you vote for it? BART STUPAK: Well, no one has seen the President’s bill yet. We’ve seen proposals. The President indicated yesterday four more proposals he’d like to incorporate. So, we want to see the bill. But, the bill that they’re using as the vehicle, is the Senate bill. And if you go to page 2,069, through page 2,078, you will find in there, the federal government would directly subsidize abortions. Plus, every enrollee in the Office of Personnel Management enrolled plan, every enrollee, has to pay a minimum of $1 per month toward reproductive rights, which includes abortions. STEPHANOPOULOS: So, if the President doesn’t change the Senate bill, you can’t vote for it? STUPAK: No. We’re not going to vote for this bill with that kind of language in there. The President says no federal funding for abortion. I have eight pieces of legislation we currently have in federal law that says no public funding for abortion. Take any one of these and insert the language. And we’ll be happy. We can support this legislation. We voted for health care before. I want to see health care pass. I agree with the Secretary. People are being priced out of the market. We must have health care. But, boy, there’s some principles and beliefs that some of us are not going to pass. For Bart Stupak government funding of abortion on demand is a deal breaker – a moral and ethical line in the sand that he will not cross. Two questions we need to consider in light of this development. First, what does it say about our society that we are surprised when our leaders actually make a stand for a biblically based principle like standing up for the rights of the unborn? Shouldn’t that be the rule, rather than the exception? Second – and here’s where things get a bit more uncomfortable- where do we find our own personal “line in the sand”? Let’s face it, Bart Stupak’s unwillingness to budge on this issue is not the best way to make friends and influence people, especially within the ranks of his own party. This will cost him – committee positions, support for legislation tat will benefit his constituents, maybe even his job as a congressman. Are there principles in your life and mine that are so important, so non negotiable, that we would be willing to pay any price rather than compromise them? No doubt one of the earliest lessons we learn in this world is that we’ve got to “go along to get along”. We can always ask for forgiveness later. But when we come to faith in Jesus, we discover that the essence of the Christian life is making a stand. Those who know Jesus understand that loving the Lord and being faithful to Him is our line in the sand, the principle we are willing to stand for at any cost. How refreshing that a vivid illustration of such a principled stand is still to be found in Washington today.